The days when flowers for men seemed awkward are long gone. Today, sending flowers to a male acquaintance, boyfriend or husband is as natural as sending them to anyone. You’re not limited to flowers, either. Floral delivery choices include a myriad of options ranging from live plants to gift baskets. Birthday – Say happy birthday by sending flowers or gifts! Arrangements for men typically include dark, rich colors, such as burgundy, gold or bronze flowers, with plenty of greenery. Traditional vases are fine, but alternatives such as Teleflora’s car-shaped container may appeal to your guy’s sense of style. Anniversary – Wives, you’re not the only ones who appreciate flowers on your wedding anniversary. Consider sending your spouse a gift of flowers. Roses are the ultimate sign of love—red symbolizes passion, pink is friendship and white, purity and long-lasting love. New job or promotion – Celebrate milestones such as a new job or a promotion with a gift such as an office plant that will provide long-lasting enjoyment while scrubbing the office air clean of copier ink fumes and other harmful toxins. Plants in gift baskets such as a peace lily (spathyphyllum) offer air-cleaning properties, as do ferns and many other low-light plants that are great for the office. Other ideas include orchids and bonsai, which lend an elegant, exotic air to an office. Florists often create gifts for men with an unusual twist, which makes them both fun to shop for and for that special someone to receive. For example, Proflowers offers an inexpensive Succulent Garden arrangement wrapped in burlap that includes hens and chicks and other succulents. Other ideas include terrarium gardens. Your florist can create a unique terrarium garden that includes accent pieces reflecting the recipient’s hobbies or likes, or you can find ready-made terrarium gardens to be sent as gifts on florist websites. If you’re not sure whether a plant will survive in the home or office, a gift basket filled with his favorite candies or treats is sure to please. Gourmet gift baskets include crackers, cheese and spreads he might enjoy, while candy baskets can be customized with his favorite chocolates. Before calling or ordering flowers or gifts online, have the recipient’s address, telephone number and name handy, as well as your credit card to order flowers and gifts. It’s best to give your florist at least 48 hours notice; some may charge extra for rush deliveries. Lastly, make sure that the man in your life is comfortable receiving flowers, plants or gifts at work via floral delivery. 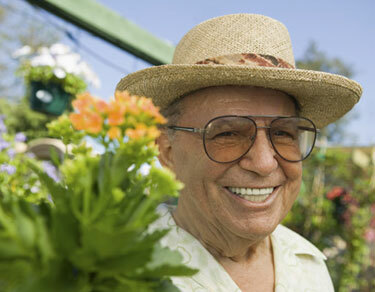 Sending flowers, plants or gifts to men shows your thoughtfulness and helps celebrate achievements and milestones. With new selections available from many florists that are especially designed for men’s tastes and interests, it’s easier now than ever before to find something within your budget that he will enjoy.